If baby teeth don’t fall out, is that a problem? Deciduous or ‘baby’ teeth are pet’s first set of teeth. 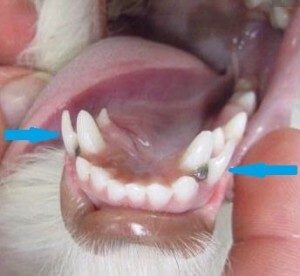 As the puppy or kitten matures, the roots of the baby tooth dissolves, the tooth gets wobbly, then eventually falls out. This allows room for the developing adult tooth to emerge in the proper location. If this process goes according to plan, all of the adult teeth are generally in place by six months of age. Sometimes that process doesn’t work as it should. 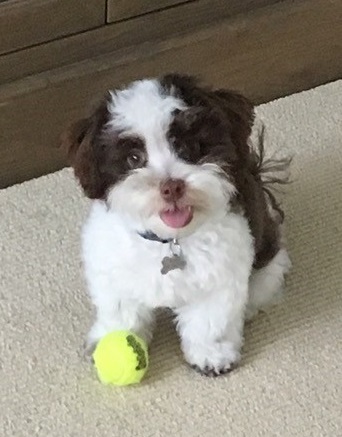 Hawthorne Hills Veterinary Hospital’s Pet of the Month for July is a handsome Havanese puppy named Yogi. 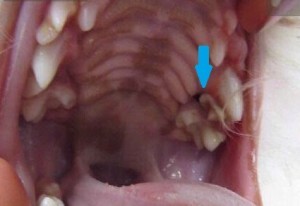 A number of Yogi’s baby teeth didn’t fall out as they should have when his adult teeth were coming in. This is a common problem in many smaller breed dogs and needs to be addressed when the pet is young. 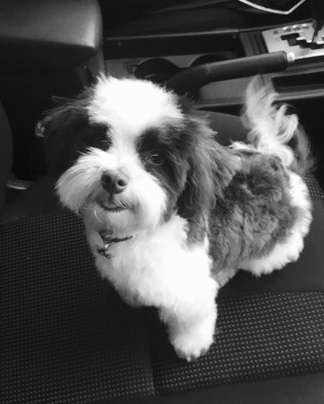 We hope that sharing Yogi’s story and pictures will help other pet owners recognize this issue and talk with their veterinarian who can make sure their furry friend develops a healthy smile. 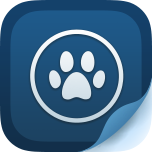 It is important to examine puppies on a monthly basis as they are growing to catch these changes at an early stage. Recognizing the problem and discussing the options with the owners helps to avoid last minute surprises. Corrective actions need to be planned appropriately, timing is critical and in the case of multiple retained teeth, the procedure may take an hour or more to complete. 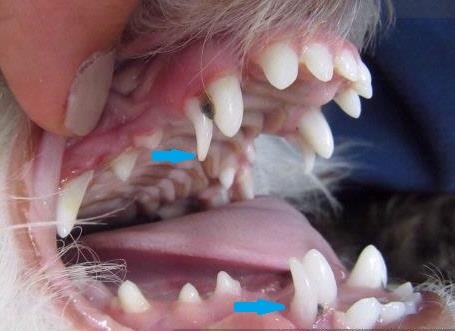 Yogi had all 4 of his baby canine teeth present at the same time as his adult canines were coming in. You can see he already had debris caught in the space between the teeth. He also had 2 upper premolars still retained – one is visible in the photo showing the inside roof of his mouth. This tooth was difficult to see from the outside as it was hidden behind the adult tooth. However, you can see the dark shadow of debris caught at the gumline. Extraction of retained deciduous teeth can be a delicate procedure as the roots of the teeth are quite long and fragile. It is essential that we get the entire root out without damaging the adjacent developing adult tooth. Treatment involves anesthesia, dental radiographs and extraction of the deciduous tooth. In Yogi’s case we combined his dental care with his neuter surgery at six months of age so he only had to undergo anesthesia once. 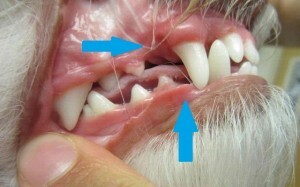 Here is what Yogi’s teeth looked like after they were extracted. 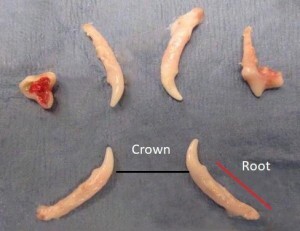 Notice how long the roots of the canine (fang) teeth are compared to the small crown. The premolar on the left is just the ‘cap’ – those roots had almost completely resorbed. However, the premolar on the right still had one complete, and long, root present. Here you can see Yogi’s healthy mouth 2 weeks after his tooth extractions; no more crowding or trapped debris! If you suspect your pet has retained teeth, or any other dental problem, it is important to seek veterinary care from a practitioner skilled in dental work. Your pet deserves to have a healthy comfortable mouth.